Wild goalie Darcy Kuemper stops a shot by the Blackhawks' Michal Handzus in the first period of Minnesota's 2-1 win on Thursday. 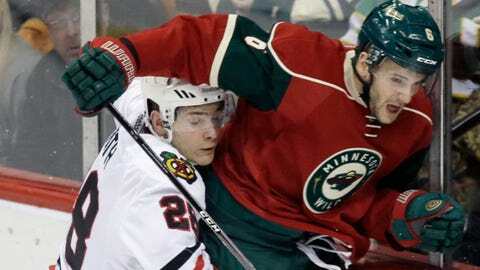 ST. PAUL, Minn. (AP) — Last year, the Chicago Blackhawks gave the Minnesota Wild a quick exit from the playoffs. This year, the Wild are giving the defending Stanley Cup champions all they can handle. Jason Pominville and Matt Cooke scored first-period goals and Darcy Kuemper made 33 saves and the Minnesota Wild defeated the Chicago Blackhawks 2-1 on Thursday night. After losing a five-game series in the first round of last year’s playoffs, the Wild have won three of four against the Blackhawks this season. "I know we get geared up to play that team," Wild coach Mike Yeo said. "I think the fact that we’ve played them as much as we have, I think our guys are confident going into the game knowing we can play with them. "Obviously they’re such a great team, and we have so much respect for them, we haven’t taken any nights off against that hockey team." Kuemper was making his sixth consecutive start as Minnesota’s top two goalies, Josh Harding and Niklas Backstrom, have been sidelined with health problems. The Wild are 5-3 with rookie in the net this season. "I’m pretty confident right now," Kuemper said. "Obviously I just want to go in there and every time I get a chance, help the team win. And when you’re getting wins like this, obviously it’s easy to keep rolling and come to the rink every day with a smile." Pominville opened the scoring at 8:08 of the first period. Dany Heatley carried the puck across the Chicago blue line and passed to Mikael Granlund near the goal mouth. Granlund spun back around and slid the puck across the slot, where Pominville was waiting to send it in the open net for his 20th of the season. "He’s the type of player that doesn’t really need to know I’m there," Pominville said of Granlund. "He just has a feel for it." The Blackhawks killed off a 5-on-3 power play, but Minnesota doubled its lead late in the first period. Justin Fontaine won a race to a loose puck and tipped it to Cooke, who slipped it past Antti Raanta from the left faceoff circle. "They made a decent play," Blackhawks coach Joel Quenneville said. "After the big kill that was a deflating goal, but there was still a lot of hockey left." Raanta, who entered the game with a 12-1-3 record this season, was upset with himself after the game for putting his team in a 2-0 hole early. "Their first goal was pretty nice, tic-tac-toe, but the second one was too easy," Raanta said. "When they get two goals in the first period you’re behind all the time. It’s much harder to play because Minnesota was defensively so good. Every goal counts and today there was one easy goal so that’s not a good thing." Kuemper got a little help from his defense to keep it 2-0 late in the second. During a Minnesota power play, Pominville tripped at the Chicago blue line and Marian Hossa pounced for a short-handed breakaway. But defenseman Ryan Suter caught up to Hossa just in time to prevent him from getting a clean shot. Kane’s goal prevented them from being shut out for the first time in 120 games, but the Blackhawks lost in regulation for only the second time since Dec. 15. "They’re the best team in the league and … they’re going to see every team’s best game. It’s pretty impressive what they’re doing, even this year," said Parise, who returned to the lineup after missing 14 games with a broken left foot. "For whatever reason, our game elevates when we play them. And I thought … we did a good job of containing their top players. Other than Kane getting that one at the end, we did a pretty good job of neutralizing them."